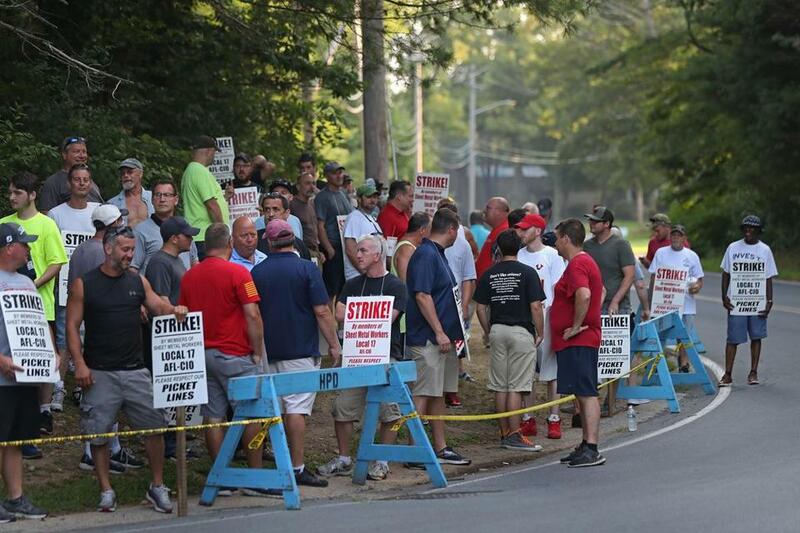 Sheet metal workers picketed in Hingham last week. About 1,400 sheet metal workers went back to work on Monday after agreeing to a contract that put an end to their 12-day strike. Boston-based Sheet Metal Workers Local 17 members voted to ratify a new contract with the Sheet Metal Workers and Air Conditioning Contractors’ National Association at a union meeting Sunday afternoon. Few details of the four-year pact were made available, but Local 17 said it included wage increases and “improved overtime provisions” and that the contractors had increased their offer after union workers went on strike Aug. 1. The contractors’ association and the Building Trades Employers Association did not respond to messages seeking comment Monday afternoon. The deal comes amid growing concern about high construction costs and labor shortages, after years of booming development in and around Boston, and as middle-class Bostonians — union members included — struggle with the cost of housing. The union had pushed for higher wages — and double pay for overtime after 10 hours on weekdays and eight on weekends — saying that its members had sacrificed to help keep subcontractors afloat during the slow years that followed the recession of a decade ago. Now, working on fixed-wage, multiyear contracts, they said, those same subcontractors have been profiting handsomely during the current boom. The double time, and some undisclosed wage increases, were included in the final deal. The contractors group had resisted that push, saying its previous offer to the union represented $97 an hour in wages and benefits, a $10 boost over the existing contract. A richer deal, they said, would make it harder to compete with nonunion contractors and would not be sustainable. Union members overwhelmingly rejected the initial offer and walked off most job sites on Aug. 1, though labor agreements on some big projects include “no-strike” clauses that kept workers on the job. An extended work stoppage would have slowed building projects across the region, rippling out to other trades that work on buildings after sheet metal workers have installed ductwork, HVAC systems, siding, and gutters. “With this new agreement, we’ll ensure that more hard-working families can retain and achieve the decent, middle-class life that they work so hard for,” Butler said. Tim Logan can be reached at tim.logan@globe.com. Follow him on Twitter @bytimlogan. Allison Hagan can be reached at allison.hagan@globe.com. Follow her on Twitter @allisonhxgan.